A Reformed White Nationalist Speaks Out On Charlottesville Former white nationalist Christian Picciolini says he was "lost" and "lonely" when he was recruited into a white supremacist group as a teenager. He now runs a nonprofit that advocates for peace. 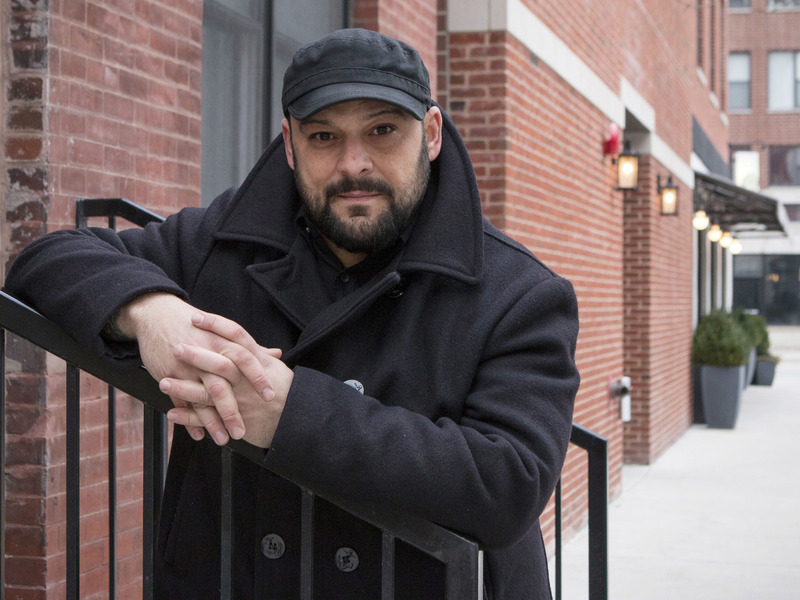 Christian Picciolini, founder of the group Life After Hate, poses for a photograph outside his Chicago home. Picciolini, a former skinhead, is an activist combatting what many see as a surge in white nationalism across the United States. Picciolini says he renounced ties to the neo-Nazi movement in 1996 when he was 22 years old. He went on to co-found a group called Life After Hate and wrote a book entitled Romantic Violence: Memoirs of an American Skinhead. Now the reformed white nationalist runs a nonprofit that advocates for peace. The rhetoric that's coming out of the White House today is so similar to what we preached ... but in a slightly more palatable way. Picciolini understands all too well the type of anger that was on display in Charlottesville, Va., over the weekend. He spoke with NPR's Stacey Vanek Smith about his reaction to what unfolded, and about the divisiveness that's been growing in the country over the past several months. It was both disheartening to me but also, unfortunately, not a surprise because my organization and myself have been warning about this specific situation for many, many years. You know, we left the movement 30 years ago and have spent the last 20 or so years trying to help people disengage from these extremists groups. We've also seen that underground this has been growing, but it's also been shape-shifting. It's gone from what we would have considered very open neo-Nazis and skinheads and KKK marching, to now people that look like our neighbors, our doctors, our teachers, our mechanics. And it's certainly starting to embolden them because a lot of the rhetoric that's coming out of the White House today is so similar to what we preached ... but in a slightly more palatable way. If underneath that fundamental search is something that's broken — I call them potholes — is there abuse or trauma or mental illness or addiction? In my case, many years ago, it was abandonment. I felt abandoned, and that led me to this community. But what happens is, because there are so many marginalized young people, so many disenfranchised young people today with not a lot to believe in, with not a lot of hope, they tend to search for very simple black-and-white answers. Because of the Internet, we now have this propaganda machine that is flooding the Internet with conspiracy theory propaganda from the far right — disinformation — and when a young person who feels disenchanted, or disaffected, goes online, where most of them live, they're able to find that identity online. They're able to find that community, and they're able to find that purpose that's being fed to them by savvy recruiters who understand how to target vulnerable young people. And they go for this solution because, frankly, it promises paradise. And it requires very little work except for dedicating your life to that purpose. But I can say that they're all being fooled, because the people at the very top have an agenda. And it's a broken ideology that can never work, that in fact, is destroying people's lives more than the promise that they were given of helping the world or saving the white race. I believe that the world has now seen what we have been sweeping under the rug for many many years — thinking we were in a post-racial society. ... I think that this catalyst shows the world, 1: that it's a problem, a real problem, that exists in our country; 2: that white extremism should be classified as terrorism, and now that we attached the terrorism word to it, it will get more resources. It will be at the top of people's minds. What people need to understand is that since Sept. 11, more Americans have been killed on U.S. soil by white supremacists than by any other foreign or domestic group combined by a factor of two. Yet we don't really talk about that, nor do we even call these instances, of the shooting at Charleston, S.C., or what happened at Oak Creek, Wis., at the Sikh temple or even what happened in Charlottesville this weekend — as terrorism. NPR's Dustin DeSoto contributed to this report. NPR's Denise Guerra edited audio for this story. NPR's Maquita Peters produced this story for the Web.